“In recent years, natural gas competed more effectively with coal as a fuel for electricity generation as the cost of operating natural gas-fired generators fell below the cost of operating coal-fired generators in some regions, changing the least-cost dispatch ordering of available units. EIA’s most recent outlook shows how generation market shares respond to changing fuel prices. At any point in time, short-term competition between existing coal- and gas-fired generators—i.e., the economic decisions determining which generators will be dispatched to generate electricity—is largely dependent on the relative operating costs of each technology. Fuel costs represent a major portion of the total operating costs. The fuel cost ratio in the chart above illustrates the relative competitiveness of dispatching coal steam turbines versus natural gas combined-cycle plants. A second aspect of competition occurs over the longer term, as developers choose which fuels and technologies to use for new capacity, and whether to make mandated or optional upgrades to existing plants. The natural gas or coal share of total generation depends both on the available capacity of each fuel type (affected by the latter type of competition) and on how intensively the capacity is operated. In 2012, the national average per-megawatthour costs for producing electricity from coal steam plants and natural gas combined-cycle plants were nearly equal. In the Reference case forecast (shown in the graph above), natural gas plants begin to lose competitive advantage over time as natural gas prices increase relative to coal prices. Because fuel prices vary by region and because considerable variation in efficiencies exists across the fleets of both coal-fired plants and combined-cycle plants, continued competition for dispatch between coal and natural gas is expected, even in the Reference case. 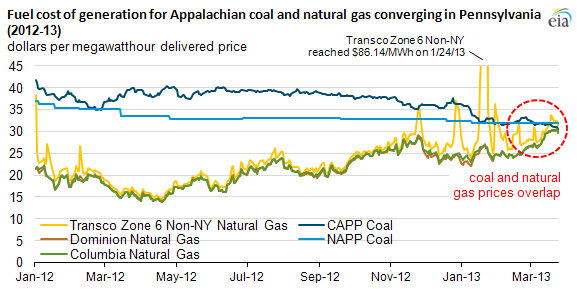 The coal and natural gas shares of total electricity generation vary widely across the alternative cases. The coal share of total generation varies from 28% to 40% in 2040, and the natural gas share varies from 18% to 42% (see graph below). In the High Oil and Gas Resource case, natural gas becomes the dominant generation fuel after 2015, and its share of total generation is 42% in 2040.